Ordinary spaces become extraordinary with a few simple flourishes and a human touch. Late spring, summer and early autumn provide ample time to spend outdoors when the weather is mild, especially from mid-afternoon to dusk. A drab back garden can be turned into a cosy hangout that even older kids might deem cool! Many patios boast only the starkness of grey concrete: the huge unattractive slab that acts as the patio deck. If the deck doesn't consist of slate, flagstone or other organic materials adorned with earthy tones, a simple and cost-effective way to update is by using a stain. When properly applied, concrete stains will emulate the post-finish of a stone-tiled deck. If the deck itself isn't perfectly flush or tapered to allow for drainage, a thin layer of grout can be set before the finish is applied. If there is no deck whatsoever, a brick patio is a cheaper do-it-yourself alternative to laying a full deck. Bricks can even be laid on a sandbed, though a cement layer is the better choice to preventing shifting. Wood is also an attractive medium, but it does not keep the way brick and concrete do and even when sealed is subject to water damage and pests. Dirt and lawn areas are ridiculously easy to alter. Actual pavers can be applied anywhere grass can be removed - it's best to at least cut the general shape of the paver out of the turf first. Peripheries with shrubbery can be augmented with a low-lying ornamental brick layer - say three or four bricks tall at most - with can be staggered and either set with quick setting concrete or grout mix. If a shrub periphery has yet to be installed, several yards of dirt and a supply of bricks - oblong, hexagonal, and half rounds work best - can be staggered at an incline for a terraced effect. Shrubs can go in afterwards. Other low-cost elements can spruce up a once-lifeless patio and back garden. These include ground-level lighting, pottery planted with assorted annuals or small colourful shrubs, and water features. A high-quality picnic table can provide a place to eat and relax in your outdoor space. Low-voltage garden lights come boxed and connected with a single card for easy spacing along the shrubline or edge of the deck. Multicoloured lenses can lend a soothing, even ethereal, effect. Stone, fauxcrete and durable fibreglass pottery is available in a myriad of sizes, finishes and styles that will complement the look of any home, from Greco to Spanish to modern. Fibreglass is lightweight and longlasting but stone may still be cheaper. Colourful annuals like tall-growing snapdragons with a white alyssum lip boundary, or small fragrant shrubs like gardenias and hibiscuses do well in pots. 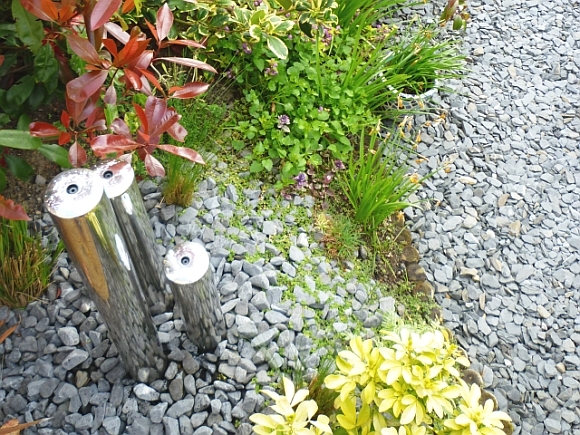 Water features tend to be the culmination of many back garden design projects. Few things are more appealing than the sound of running water when the temperature may be approaching eighty degrees. Again, countless designs and colour finishes are available. Fountains don't have to be perfectly round and sit in the middle of the garden. Quite a few fountain designs exist now with flat or angular sides that allow conformity to walls and corners. Many of these fountain styles are best because they tend not to overwhelm and emulate a small waterfall or running brook. Since eating outdoors is often as thrilling for adults as it is for children, doing so gives both the opportunity to act their age - with adults, that means the age of their inner child. Outdoor oxygen is always better than circulated recycled air, and many people, particularly adults, don't get anywhere near the amount of sunshine they should. Sunshine has been referred to as the immune system's vitamin, and is usually effective in erasing a sluggish demeanour. The best perk of eating outdoors is the avoidance of panic when food hits the floor. A garden hose fitted with a spray nozzle will not fix anything indoors, but it can work wonders in minutes on a stone patio!